Of course, we love the maritime theme and can only wonder if it was in someway influenced by the American Sail Training Association’s TALL SHIPS CHALLENGE Series which recently made several ports of call in their neighborhood. Probably not but it’s cool anyway. Too bad they didn’t use a photograph of an actual tall ship like the USCG Barque EAGLE or the more local Lady Washington or Adventuress. That could have brought some much appreciated attention to the good work that these vessels do in preserving our country’s rich maritime heritage. And wouldn’t it be great if Microsoft took a few bucks from the $500 million earmarked for this campaign and used it to support the youth programs of these and other Pacific Northwest tall ships. Now that would be super corporate social responsibility. Okay, I know I’m dreaming but what the heck, it’s worth blogging about. 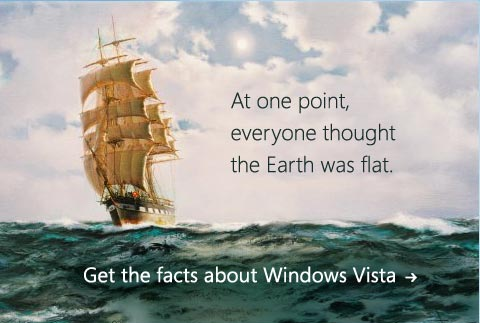 Like they say, “At one point, everyone thought the Earth was flat.” But then they got on a tall ship and the rest is history (or maybe science). How about Educational Partner-Ships too! Interesting post, Peter. Hmm…maybe Microsoft should become ASTA’s next corporate sponsor!